John MacLeod was born in Colinton Mains, Edinburgh on 23 November 1938 and was educated at St Peter’s Primary School in Morningside and St Anthony’s in Leith, He joined Hibernian the club he supported as a school boy. playing first for Edinburgh Thistle, the feeder team of Hibs. Then he went with Joe Baker to Armadale Thistle for what Scottish clubs like to call “toughening up” and he then undertook his national service with the RAF. But by 1961 he was so established (despite being only 5 feet 5 inches tall) that he earned four caps that year for Scotland and it was on the back of this rapid rise to fame that Arsenal paid their highest ever transfer fee at at the time of £40,000 for MacLeod with John playing his first match against Burnley on 19 August 1961. It was a 2-2 draw in front of 47 836, with Skirton on one wing and MacLeod on the other. He also played in the (at least at the time) famous 6 October 1962 game against Tottenham and White Hart Lane. Tottenham were at the height of their fame at that time and had beaten Nottingham Forest 9-2 a week before. Dave Mackay, John White and Cliff Jones put Tottenham three up in 26 minutes, and Arsenal feared the worse. Arsenal pulled it back to 3-2 including a stunning 25 yard shot from David Court, but Jones took the score back to 4-2 before half time, and with Billy Wright in charge of Arsenal, everyone feared the worst. But on 53 minutes George Eastham laid on a goal for John MacLeod that was a reminder of every reason why Eastham and MacLeod were at the club. With 17 minutes left, Geoff Strong ran on to a through ball and clinched a draw that astonished the Tottenham worshipping press of the era. The full Arsenal team on that day was: John McClelland, Eddie Magill, Billy McCullough, John Snedden, Laurie Brown, Vic Groves, John MacLeod, Geoff Strong, David Court, George Eastham, Alan Skirton. The crowd at WHL was 61,749. In 1961/2 Arsenal came 10th, but the following season Arsenal came 7th (the highest under Billy Wright as manager and amazingly the 7th position gave a qualification to the Inter Cities Fairs Cup. Arsenal were knocked out in the second round in the 1963/4 season. However in the first round MacLeod scored the opening goal in Arsenal’s very first European match, the 7–1 away defeat of Danish side Stævnet on 25 September 1963. 13 minutes later Joe Baker scored. “I had a very good game that night, and we beat them 7-1, but I fell out with a couple of their players quite early in the game. In response to the problems of the first game Macleod was then dropped by manager Billy Wright for the return leg the following month in order to provide him some protection and not risk injury in a match already won. Arsenal lost that return leg 2-3 and went out in the next round to RFC Liege. But we should remember that both Macleod and Baker had already played in Europe two years before when Hibs played Barcelona and scored at the Nou Camp in (another) 4-4 draw on 27 December 1960. Joe Baker also scored twice. and as a further twist of coincidence Hibs led 4-2 at one stage. In the return leg on 22 February 1961 MacLeod put Baker through into the area, he was brought down and Hibs scored the winner from the penalty. After the penalty, John recalls, “I got chased up to the Lemonade (Dunbar] End by a couple of their players. One of them was called Jesus – what chance did I have? But three Hibs supporters jumped the wall and got between me and the two big boys and spared me any retribution.” After drawing twice with Roma in the semi-final Hibs had the right of home advantage in the replay but sold the right to Roma, to get a bigger crowd – and lost 6-1. Hibs then sold Baker to Torino then Macleod to Arsenal within weeks of each other in the summer of 1961 as a response to requests for pay rises of £2 a week for MacLeod and £5 for Joe Baker. Macleod would go on to make 112 appearances in three seasons for Arsenal, scoring 27 goals, before history repeated itself and he was once again sold against his wishes, this time to Aston Villa. “I don’t want to speak ill of the dead but Billy Wright was a very poor manager. I was forced out. He wasn’t pleasant, he told me he would make life bad for me if I resisted him. Although Wright was indeed a disaster of a manager, and changes were needed, in one sense Wright had a reason to move MacLeod on – although not in the appalling way in which he did it. In 1964 George Armstrong was pushing for a place in the side. MacLeod stayed at Villa for four years making 123 (or 125 depending on your source!) appearances before playing for KV Mechelen in Belgium 116 times and then returning to Scotland with Raith in 1971. One source has him retiring from football in 1972 but another has him playing for Newtongrange Star in Midlothian. I have one other report of him living in Salisbury – which I take to mean Salisbury in Wiltshire. Another report says that he forged a successful career in the financial sector, which is good to hear. Ii had the pleasure of Johnny macleods company today in rose street then later in george street edinburgh. We had a lot in common , not just a love of the hibs. A true gentleman. 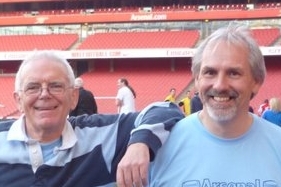 If Mr McKenzie-Luke has the pleasure of meeting john MacLeod again tell him he is not forgotten,when I am in company with young Arsenal supporters who yap on about Henry & co they are reminded of John ,Joe Haverty Alan Skirton etc.Loved that old George Swindon side pity George was ex keeper and therefore stark staring things could have been so different. Saw John in Salisbury (in Wiltshire) city centre yesterday. Looked in fine fettle. Brilliant guy – did a little work for him a few years ago. As a long suffering Villa supporter of 45+ years it was a joy to hear him talk of his days at Villa, Arsenal, Hibs et al. If I see him this weekend I shall remind him it’s the anniversary of Jimmy Greaves and England beating Scotland 9-3! I know what reaction that will get! Top bloke. A real gent. Thanks Mike – and please give him regards from the Arsenal History Society. I knew Johnny when he played for under 21 Juvenile side Edinburgh Thistle and I was with Edinburgh Athletic. We were partners at sprints and he was a speed merchant while wearing spikes. After training on Tuesday and Thursday nights Johnny used to give me a lift on his motor bike. He always gave 100% at training and no surprise he made it to the top. Johnny Macleod is a first cousin of my dad’s, and I would love to get in touch. My 10 year old son is football daft and an Arsenal fan, so you can imagine his delight to discover his famous relative! Absolutely wonder Kirsty. Tell your son, the Arsenal History Society really wishes him well. I saw the great JM in his first game for the gunners and his last. He was one of the greatest players I have seen. If AFC had been luck enough to have a decent manager and board, Johnny would have stayed and seen his career out. Best wishes little man.